Linking up with Tara & Vicki for The Nail Files! 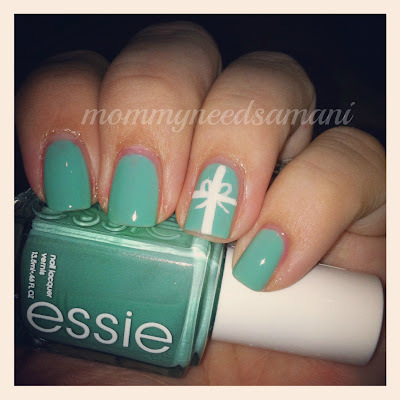 Today is Turquoise & Caicos by Essie. I accented with Rimmel's White French Tip. The color is a little on the sheer color but after 3 coats and a fourth on a few nails, the color is gorgeous!!! Love that color!!! Looks fabulous! :) Happy Friday! I love that your ring finger looks like a little tiffanys box! Very pretty color. I love your nails, they look fabulous! The bow is so cute! Oohh sooo pretty - love the nail art! I love this! Will you please come do my nails! You are so creative! seriously love your accent nail! so cute! your little accent is perfect!! So cute! I love the T&C!